Flower Duet has many online resources to help you learn to make your own bou­ton­nière or but­ton­hole. Check out all of these ideas from your flo­ral design­ing sis­ters at Flower Duet. Alter­na­tive Bou­ton­nieres in pur­ple and grey by Flower Duet. When choos­ing flow­ers, it’s best to choose ones that last a long time out of water and can endure hugs. Read our tips on how to choose flow­ers for bou­ton­nières & cor­sages. Flower Duet flower arrang­ing stu­dent plac­ing a wire through a hot pink rose stem to make a bou­ton­niere dur­ing a wiring class at our Flo­ral Design Stu­dio. Be sure all the mate­ri­als dry before you start as the flo­ral tape will not adhere if it is wet. 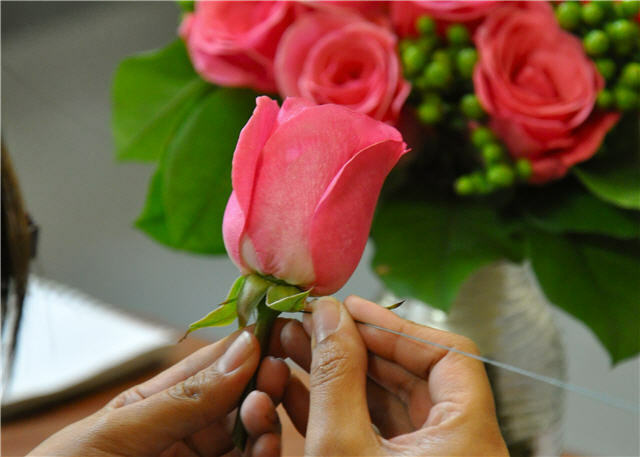 Cut the rose stems to a length of 1-inch and insert the wire thru the stem about ¼ down from the base of the head. Run the wire thru so that the stem has the wire stick­ing out on both sides even­ly and then drop them down to par­al­lel where the stem had been, mak­ing a new thin stem. Using flo­ral tape, wrap the stem and wire to join them togeth­er cov­er­ing the wire and stem com­plete­ly. Add any leaves or small flow­ers by tap­ing the stem to the taped “wire stem” and trim­ming the excess stem before run­ning the tape down the wire. Be sure to stick a bou­ton­niere or cor­sage pin into the base of the design before the event. Casey Schwartz shows Sheryl Bor­den of Cre­ative Liv­ing TV how to wire basic flow­ers. This skill builds the foun­da­tion for cre­at­ing any­thing from the basic man’s bou­ton­niere to a woman’s cor­sage. From there, you can cre­ate, hair wreaths, gar­lands, and even flo­ral dog col­lars. Learn how to com­bine beau­ti­ful suc­cu­lent plants with fresh flow­ers to cre­ate a stun­ning bridal bou­quet from the flo­ral design­ing sis­ters, Kit & Casey of Flower Duet. Learn more about what the best bou­ton­nière flow­ers are for last­ing well out of the water and endur­ing a day of hugs, pho­tos and jump­ing for joy.